How Do I Print A Commercial Invoice In StorePep? Before we delve further into the details, let us first understand what a commercial invoice is. The Commercial Invoice is a legal customs document that is typically required when exporting items internationally. It records information like the parties involved in the transaction, the goods being exchanged, and the amount that is due upon delivery. The HS codes are primarily used to calculate customs duty. What are the details to be included in it? The identity of the buyer and seller. Date and other details of the sale. The quantity, weight, and volume of the shipment. Type of packaging and complete description of goods. Insurance, shipping, and other charges applicable. 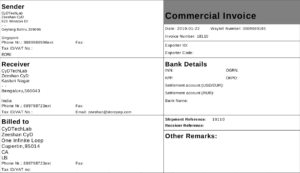 How to print the commercial invoice in StorePep? Once an order has been placed by the customer, it will get auto imported into the store owner’s StorePep dashboard. Consider a test order 18110 which is shown in the above picture. This order is in the processing stage and the first step that you need to take is to generate a shipping label. To create a Label, select the order, go to “Bulk actions” and click on “Generate Labels”. The label for the order will be generated. To get order details, click on the order number and it takes you to the Order Summary page, where you can see the Rates summary, Label summary, and all other details. In the order summary page, below the rate summary, you will find the “Extra Documents” as shown above. Simply print put these invoices and you are good to go! If you still have any queries, just fill out our contact form and our team of shipping specialists will get back to you!